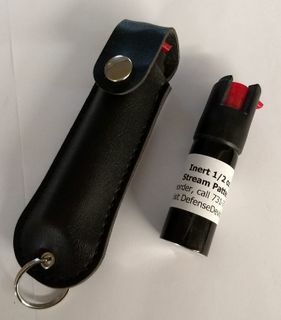 Keyring Holder Pepper spray made by Police Magnum is the best self defense item you can carry as recommended by experts. The Police Magnum formula is as hot as bear spray but in a convenient size allowing you to carry it wherever you go. The 3/4 oz. size has 50% more formula than the next smallest size giving you more security knowing you will have enough to do the job. You will get 12-14 shots out to 8 - 10 feet. The unit is 5.5 inches long, 1.5 inches wide and 1 inch deep. Refills are available. There is nothing hotter or more effective at twice the price. Police Magnum assays their batches to ensure potency. They send out test samples to an objective 3d party laboratory to ensure the formula meets their standards. Its as hot as the leading bear spray, guaranteed. Since bear spray is about 90% effective on bears, do you think humans have a chance? You will be glad to have this product with you when the chips are down. Repels dogs and other wild animals, but will do no permanent harm. To keep it with you at all times, you might consider the quick release keyring. This allows you to separate your keys from your pepper spray when you take your car in for service or valet parking etc. Only $0.49. We cannot ship Police Magnum pepper spray to NY, MA (w/o FID), WI, HI, AK, PO boxes or APO addresses.